Happy Thursday everyone! The weekend is nearly here and Halloween is right around the corner! So instead of my usual TBT meme picture, I'll temporarily use a Halloween version of the old one. hehehe. I am really getting into the spirit this year. I even have a great costume I'm wearing. No, not Anne Boleyn (never had a chance to save enough money due to my lack of a job for a while), but Marie Antoinette. I won't be able to wear it to work (*sighs*), but I'm wearing it to a Halloween party in November. Odd, but it works! I'm reusing my dress that I wore long ago at my sweet 16. It'll be big, because I was 30lbs heavier, but oh well. There are ties on it, so it'll fit. ^.^ I also plan on this time around as Marie to be a little morbid perhaps. I'm contemplating using red makeup around the neck of where she lost her head to the guillotine. Perhaps I'll be The Ghost of Marie Antoinette. Sorry for the rant...here is my book teaser for 'The Iron Duke' by Meljean Brook. I've barely broken the cover, so this teaser is a teaser for me too. In honor of Halloween and all the spooky stuff, I've picked page 66 starting at sentence 6. Of course you can pick your own starting point, but here we go! "Remembering that, Mina's anger built into resolution. What could Trahaern to do her family that Horde hadn't already done? Nothing. And her family had always fought back, always survived. The only danger he posed was to Mina's person and her career - but no matter the damage he caused, she would survive that, too. She looked up. The rood of the lift had almost reached the next floor. The duke still hadn't spoken. Her tension began to loosen its grip. Had she mistaken his intentions, then? Perhaps he just hadn't wanted to be crowded. Metal scraped, and the lift jolted to a halt. Mina stumbled forward before catching her balance - and realized that he'd timed it perfectly. They'd stopped halfway between floors. The lift's roof concealed them from above, and if anyone entered the corridor below, the gate blocked the view of the lift's interior. Oooooooh. Can't wait to see what happens next! What are you guys wearing this Halloween (or at any event in honor of the this lovely holiday)? hehehehe it's interesting so far. 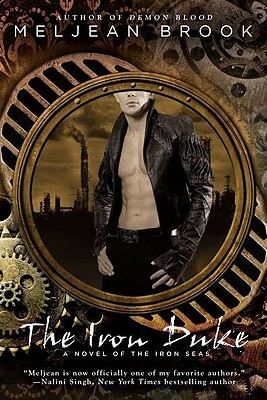 ^.^ Do read it, even though I'm not a big fan of "steampunk" I'm enjoying this for the fantasy, romance, and adventure.